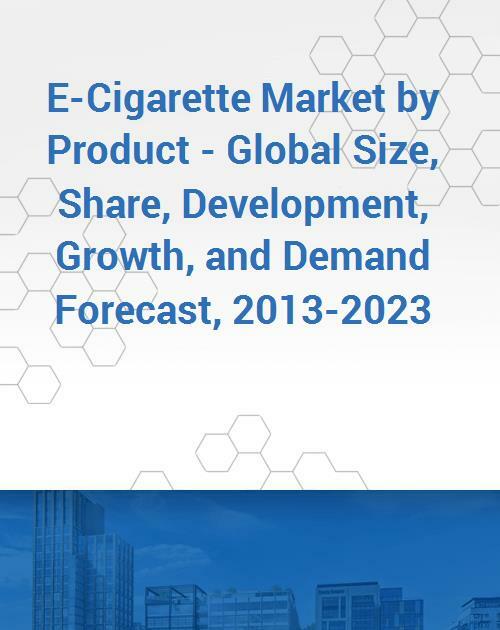 The e-cigarette market is estimated to reach $44,610.6 million by 2023, the growth in the market will be led by factors such as increasing health concerns among the smokers, demand for smokeless and ashless vaping, and surge in the number of vape shops and designated stores. Based on product, the e-cigarette market has been broadly categorized into cig-a-like, vaporizer, and vape mod. The market for vape mod is expected to witness the fastest CAGR, of around 22%, during the forecast period. Customizable vape mods are becoming a popular choice among ex-smokers, current smokers, and new smokers. Based on distribution channel, the market has been classified into vape shops, supermarkets, online, and tobacconists. Among these channels, vape shops generated the highest revenue in the e-cigarette market in 2017. APAC is the region offering ample growth opportunities for the vendors. Large population coupled with increasing urbanization has been propelling the demand for e-cigarettes in the region. China was the forerunner in the regional e-cigarette industry, with around 40% share in 2017. After the U.S. and the U.K., China was the third largest e-cigarette market in the world in 2017, and is expected to grow rapidly, during the forecast period. Globally, awareness about health concerns due to smoking has been increasing. This has resulted in the development of alternatives that help consumers to quit traditional cigarettes. Cancer caused by smoking is one of the major global concerns affecting people. E-cigarettes eliminate the risk of cancer and prevent the intake of more than 4,000 chemicals, which are produced by burning of tobacco cigarettes. Additionally, smoke generated from burning tobacco is equally harmful to humans as it is to the environment. E-cigarettes eliminate the emission of smoke, and instead, produce mist, which easily dissolves in air within seconds. This reduces the side-effects of smoking e-cigarette to a great extent. Apart from this, it also eliminates the need for dumping cigarette butts and flicking ash openly. Such factors promote safe smoking and are driving the global e-cigarette market. E-cigarettes are being adopted by consumers as an alternative to tobacco cigarettes, as they are considered to be less toxic and safer than conventional cigarettes. Consumers are focusing on replacing conventional cigarettes with healthier and less chemical vaping technology, which will pose ample of growth opportunities for market players in the coming years. The e-cigarette market has potential growth opportunities in untapped emerging economies of APAC, Latin America and Africa regions. Tobacco companies and e-cigarette manufacturers in these regions are expanding their business to achieve greater reach for their products through various channels, including e-commerce, retail partners, and grocery stores. Apart from this, companies are also acquiring local and national distributors of e-cigarettes to distribute their products in dedicated markets. Innovations and advancements in technology are expected to pave the way for next-generation products. Traditional tobacco manufacturers across the globe are moving into design, development, production, and sale of vaping products because of the increased interest of people in these products and the growing demand for tobacco cigarette alternatives. Besides, tobacco companies are entering into agreements with other companies to increase their business, including agreements based on raw material supply, patents, product rights, and other regulating factors. For instance, in 2016, Altria Group expanded its strategic framework with Philip Morris International Inc. with a joint research and development and technology-sharing agreement. Some of the key players operating in the e-cigarette market are British American Tobacco plc, Altria Group Inc., Japan Tobacco Inc., Imperial Brands plc, Philip Morris International Inc., VMR Products LLC, NJOY Inc, International Vapor Group, Vapor Hub International, Inc., and FIN Branding Group LLC. 12.5 Philip Morris International Inc.
12.9 Vapor Hub International, Inc.